With more than a billion people, a two trillion dollar economy, and the growing ability to shape outcomes in its region and beyond, India is a huge country, a colossus in every sense of the word. Its very scale means that its decisions have global impact. It is also a transparent and deliberative democracy, one that takes time to achieve consensus on important issues. Its domestic decisions on economic matters can have international effects that are, at times, unintended. And it guards against any perception of succumbing to international pressure or “playing second fiddle” to any other power, especially the United States. Focused internally, and carefully balancing its many and diverse political considerations, India does not act in haste, but with caution, deliberation, and above all, autonomy. In Our Time Has Come: How India is Making Its Place in the World, Alyssa Ayres takes stock of the risks and opportunities for the US and the world as the world’s largest democracy defines its place in global affairs. Given that India breaks the mold of the typical “ally” and will instead emerge as a unique power all its own, there is much to consider as America and the world attempt to navigate India’s rise. As a nation that, on the one hand, is home to the world’s greatest concentration of poverty, and on the other hand, is moving quickly toward being one of the world’s largest economies, India is confounding, and also essential to understand. Impeccably researched…a wonderfully detailed look at India today. Few outsiders know modern India’s politics, society and history as well as Alyssa Ayres. 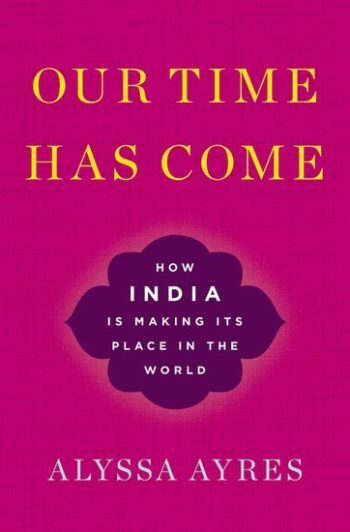 In Our Time Has Come, she chronicles India’s extraordinary rise and its future as a great global power.